Little Italy in Cleveland, Ohio is home to some of Cleveland's best restaurants and cultural institutions. At Guarino's Restaurant, we're proud to be recognized as Cleveland's oldest restaurant. We've been open since 1918 and have never closed, never drastically remodeled, and never changed our commitment to high-quality Italian-American dining at affordable prices. Our family has kept it Cleveland's oldest restaurant cooking for nearly a century, and we're proud to welcome you to spend an afternoon or evening with us. 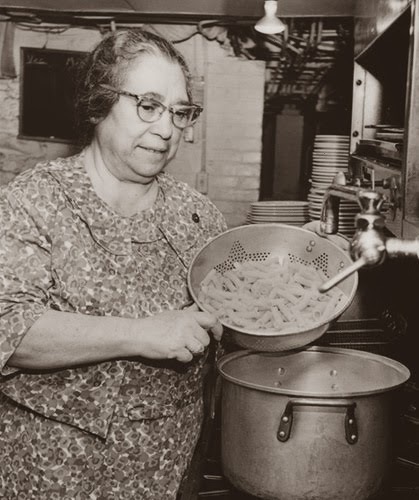 Founded as a speakeasy during the prohibition era, Vincenzo Guarino used to serve liquor in coffee cups along Mayfield Road, and his wife affectionately referred to as "Mama Guarino" did all the cooking in the basement kitchen- which still exists today. The family lived upstairs and in the rear of the building, which although is now fully occupied for the uses of the restaurant, still strongly resembles home. If you're looking for a piece of history in Cleveland, Ohio, be sure to join us at Guarino's for lunch or dinner, seven days a week. We look forward sharing our Italian-American fare with you. For reservations, call 216.231.3100 and remember, parking is always free in our attached surface lot at 12309 Mayfield Road - Cleveland, OH 44106.